Located in the Seton Hill neighborhood, Orchard Street Church is a historic 19th century church and the oldest known extant building built by African Americans in Baltimore. Founded and organized by Truman Pratt—a free black man born into slavery in Anne Arundel County—Basil Hall and Cyrus Moore, the church weathered a few extension projects over the years to accommodate its quickly growing congregation. Today, the Greater Baltimore Urban League (GBUL) manages the building and various community programs designed to help disadvantaged local youth, workers, entrepreneurs, and job seekers access to equal opportunity in employment, education, health care, housing and the civic arena. During Doors Open Baltimore 2018, Orchard Street Church will serve as the location for two different all-day special events. Participants can register for one of the Orchard Street Church guided tours scheduled to occur every 40 minutes starting at 10 AM on both Saturday, October 6 and Sunday, October 7. Afterwards, visitors can participate in Bmore NOMA’s all-day event—Redesigning the Vacant Lots in Baltimore—which includes a series of hands-on workshops with an interactive 3D model that will be used to recreate, explore, and discuss the vacant street issues in the city. In your opinion, what is the most interesting story that the Orchard Street Church has to share with its visitors? 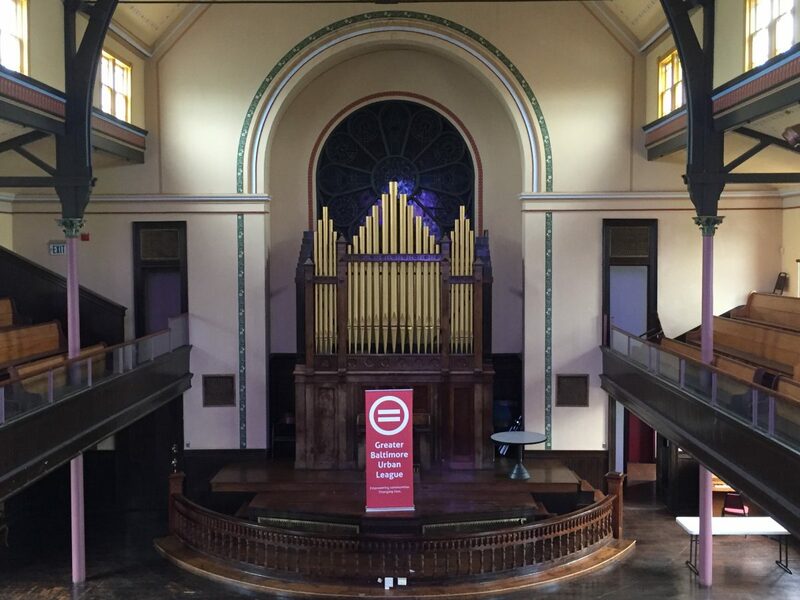 The Orchard Street Church and Greater Baltimore Urban League are Baltimore treasures hidden in plain sight. Originally built by slaves and free blacks in 1837, the church operated since its inception as a prominent black church with a community-oriented congregation. Closing its doors in 1972, the building stood vacant for 17 years during which time the windows were smashed and the building was in terrible shape. Then, the GBUL got together with the city, the state and some great preservationists to raise funding for the renovation and reopening of the church. Orchard Street Church is a living legacy of empowerment, loss, and rebirth. What inspired you and the Greater Baltimore Urban League (GBUL) to participate as a two-day special event in Doors Open Baltimore 2018? Doors Open Baltimore offers a unique opportunity to share the Orchard Street Church with a large number of Baltimore residents who may be entering its doors for the first time. What outcome or result do you hope will occur as a result of participating in this event? We hope for greater awareness of this Baltimore gem as well as the historic organization that helped save and currently stewards it—the Greater Baltimore Urban League. Since reopening the church, the GBUL has been devoted to retaining the church’s community-oriented reputation. At the same time, GBUL has its own legacy as a prominent black organization—founded in 1924 as the local affiliate for the National Urban League—helping disadvantaged Marylanders gain access to equal opportunity in employment, education, healthcare, housing and the civic arena. With the NAACP holding elections in the Church on October 6, visitors will experience the three major black institutions under one roof. Why is it important for people to learn about Baltimore’s history through its architecture? Architecture—the bricks, windows, walls, and ceilings—hold stories of people’s pasts. The grandeur, use of space, and transitions over time hold clues to the values and hopes of the people occupying these spaces over history.